How can I see statistical distribution of finish time for milestone? While Milestones do not have a duration, their start and finish times can vary depending upon how the predecessors perform. You can view these results for Milestones using Start Time and Finish Time. To view the results for a milestone, in the Result Gantt View, select the milestone. On the ribbon, click Analysis > Tasks Simulation Results > Probability Plot. 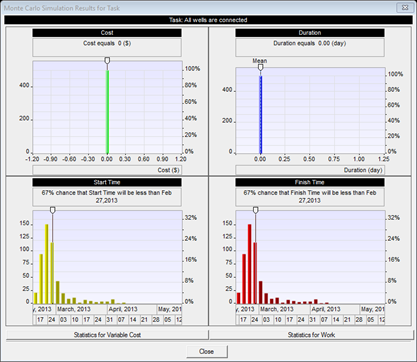 All of the probability charts appear in the Monte Carlo Simulation Results for Task dialog. Double-click on the Finish Time chart to view a detailed version of the chart including histograms and cumulative probability plots.